A link hub between two office developments required an ingenious solution to generate an open space that was welcoming to both staff and visitors. The brief was to create a column free space with maximum light. Working with the architect to form a light warm structure, a high glazed ceiling supported by timber was suggested. To create the concept of a funnel of light we had to break the normal truss tie by designing a ring beam. 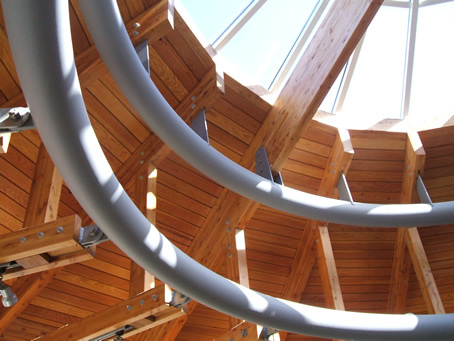 Two circular steel hollow sections were constructed in conjunction with glulam beams and timber struts to produce an effective space that tied the two buildings together whilst maintaining their own characteristics. The final design was economic, functional and unique.